Real ITSM services go through a deathcycle from misconception to a usually messy end. 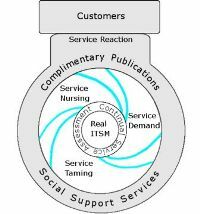 Navigating the ITSM Deathcycle can be thought of as akin to navigating the Great Barrier Reef. The intent of Real ITSM is to minimise the number of services that actually go live, while maximising the time and education of staff along the way. In the event that a service does reach the users, the opposite focus prevails: it should be kept alive for as long as possible so as to maximise revenue and job assurance. The intent however is the same – minimisation of change. Planning and strategy is forbidden. All Real ITSM acts in reaction to business pressures. Services are created only in concession to the demands of the customers. Services arrive unexpected and unannounced. First priority is to get some control over them. Once stuck with a service, the focus is on keeping it alive as long as possible to maximise revenue. Management, consultants and staff are kept happily occupied measuring and assessing the services. "While there are no really new concepts delivered here, it will save my manager time documenting how our IT department works"
The graphic is just another example of northern hemisphere cultural imperialism Don.